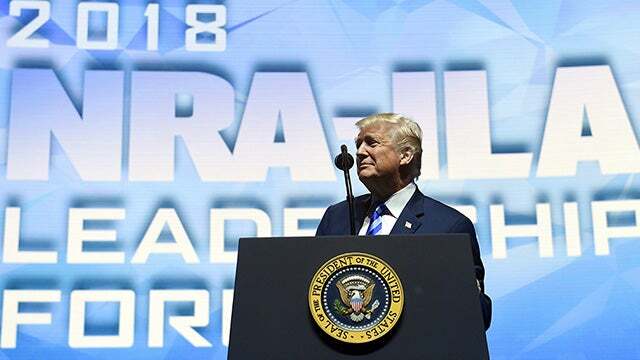 RUSH: Folks, normally we would have carried the beginning of Trump of his speech the NRA. But I can’t understand a word. The reverb on the feeds that I have in here is such that I can’t understand a word they’re saying. The echo and the reverb combined with the (applause) make it impossible. I’ve checked three different feeds, and it’s… Probably you would be able to hear it much easier than I can, but it’s still… It’s bad. So that’s why we’re not JIPping. Plus, we don’t have that many minutes left. Trump is running through some of the usual things. He’s praising to a hilt the politicians that he’s gonna endorse, and they are all getting standing ovations. Ted Cruz was one of the names he mentioned. Like I say, when he begins campaigning… You know, they’re reporting on this blue wave garbage in kind of a vacuum because they’re assuming that Trump is hated and despised, and so he’s not gonna be able to help anybody. And it’s the exact opposite. And he just finished going through the latest unemployment news on African-Americans and Hispanics, and he’s recounting the campaign. And he said, “Hey, I told the African-Americans, ‘What do you got to lose? Give me a shot! The people you’ve been voting for haven’t done anything for you. What do you got to lose? Give me a shot,'” and then he went on to herald record-low African-American unemployment. And he’s getting jack-in-the-box standing ovations at the NRA convention. RUSH: Okay, I tried during the break to listen more of the president the NRA, and my feed… Literally, it’s impossible. I’ve never heard it this bad, this reverb. So I don’t know what the problem is. I couldn’t JIP it. But I want to make an observation to you. The people in this audience love this man, and they are showing it at every opportunity, and Trump is loving it himself and having a great time, and I want to share something with you. The Drive-By Media, which is trying to destroy Donald Trump, cannot stand this. Because they look at this, and they see abject evidence of their ineffectiveness. Now, they’ll write it off. “Yeah, it’s the NRA. Of course! Of course we wouldn’t expect anything else.” But they do. They’ve spent two years trying to destroy this guy in your mind. They’ve spent two years trying to make you hate this guy, and they’re not pulling it off — and I’m telling you, it bothers them.